Commercial Folding - Flottman Company. Use our commercial folding capabilities to incorporate a folded printing piece that reengages your marketing strategy, builds interest, starts discussions and differentiates you and your organization from the competition. Our commercial folded printing capabilities brand us as an industry leader, especially with miniature folding and miniature printing. We can assist with specialty printing and folding methods such as die-cutting. Our services include folding, creasing and scoring for greeting cards, instruction booklets, multi‐fold invitations and presentation folders, as well as printing and folding for IFUs (instructions for use), DFUs (directions for use) and leaflets. We can meet all of your finishing needs. Our commercial folding expertise is beneficial to companies in the nutraceutical industry, cosmetic industry, petcare industry and more. How can commercial folding improve your business? Our Morgana folding machine can create half, double parallel, letter, and accordion folds in addition to our Duplo booklet folder that provides redundancy and capacity. These folding options combined with our abilities to bind, die‐cut and glue deliver unique products to convey your marketing message. Our commercial folded printed pieces have been placed in mailing packages, informational packets, trade show displays, point‐of‐purchase displays and product cartons. We offer a variety of sizes and fold patterns for our inserts, and can print up to six colors, or twelve colors with double pass. Every job produced by Flottman Company is governed by the accredited Standard Operating Procedures (SOPs) and Current Good Manufacturing Practices (cGMP) to monitor design, production and manufacturing. We are dedicated to continuously improving and growing in order to better serve you. We recently added a Stahlfolder TH-82 in order to increase our available fold patterns and improve our manufacturing efficiency. The new fold patterns feature multiple variations of gate folds, along with parallel and right-angle folds. 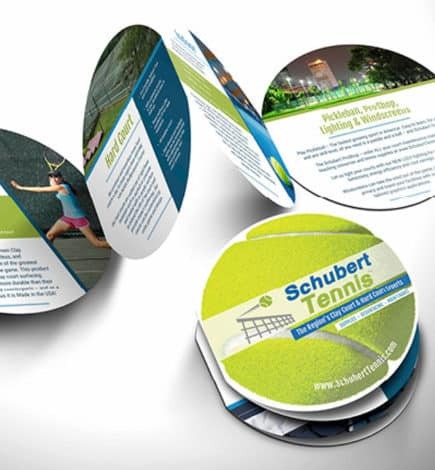 Why Choose Commercial Folded Inserts? The move to miniature folding and miniature printing often provides a production cost savings. These commercial folded leaflets provide an effective way to incorporate a great deal of information in a relatively small space that can be designed to conform to your product or packaging. Even when there is massive content and minimal packaging space we can make it work. Our miniature folded inserts for commercial applications take commercial folded printing to a whole new level with up to 238 folded panels, 6+ color designs, two-sided printing and various folding patterns that can fold down to as small as a half inch. This is the perfect means to provide usage instructions in multiple languages, with increased detail and enhanced descriptive imagery. Flottman Company’s folding capabilities can be used for inserts, outserts, IFUs, DFUs and more. These folded pieces make an amazing first impression, stimulate interest in your product and promote your brand. Commercial folded inserts also allow you to take advantage of in-pack marketing. Inserts that include coupons, rebates, social media incentive forms, cross-selling opportunities, visual instructions and redemption trackability can be used to expand your marketing strategy. In-pack marketing presents the perfect opportunity to cross-promote a new or existing product. Reach 100% of the customers that have purchased your product, and advertise to a captive audience that already knows your product, values and your brand. Consider revamping your current project, changing it from a multi-page, bound booklet into a miniature folded piece that will establish lower costs, more content space and reduced packaging space, delivering a higher return on investment (ROI). Flottman Company offers high-quality booklets and brochures, which can be used to provide instructions, promotions or any other information you would like to share with your customers. Whether you would like to share additional information in your packaging, at trade shows, or in stores or office buildings, well-designed booklets and brochures are sure to make a splash. We can also produce event invitations, greeting cards, business cards and more. Flottman Company will handle every step of production, including printing, trimming and finishing, to ensure each piece fits your needs as well as our high production standards. You can always count on the quality of the jobs we produce, leaving you more time to focus on your company and its success. Consider partnering with Rxperts Group, a strategic partnership between Flottman Company, a folding carton specialist and a label and extended label provider, for a complete packaging solution. For over 20 years the Rxperts Group has serviced the pharmaceutical, medical device and consumer packaged goods (CPG) industries with complete packaging solutions, including folded inserts, labels and folding carton production. Gain your complete packaging solution with just one call. If you need design assistance for your commercial folding project, we’ll connect you with our strategic marketing team at FUSIONWRX. Be it one fold on a card or 238 panels on a miniature printed insert, “fold us” into your marketing strategy. Connect with us today.